Announcing the FLORA, Adafruit’s wearable electronics platform and accessories « Adafruit Industries – Makers, hackers, artists, designers and engineers! Today we’re announcing our new open-source wearable electronics platform and series of accessories. We rarely announce something until it’s shipping to customers, but you’ll see a lot of these out in the world from our testers as they show off some projects – so we wanted to post about this now. For the last few years Ladyada has been thinking about everything she wanted in a wearable electronics platform for Adafruit’s community of makers, hackers, crafters, artists, designers and engineers. After months of planning, designing and working with partners around the world for the best materials and accessories, we can share what we’re up to. The hardware is now in the hands of our staff and testers! We call it the FLORA. The FLORA is not the first wearable Arduino / Arduino-compatible. Leah Buechley’s LilyPad was developed in 2007 – we wanted to also make something that’s wearable, but it needed to be a completely new platform for our accessories/modules and goals for the project. 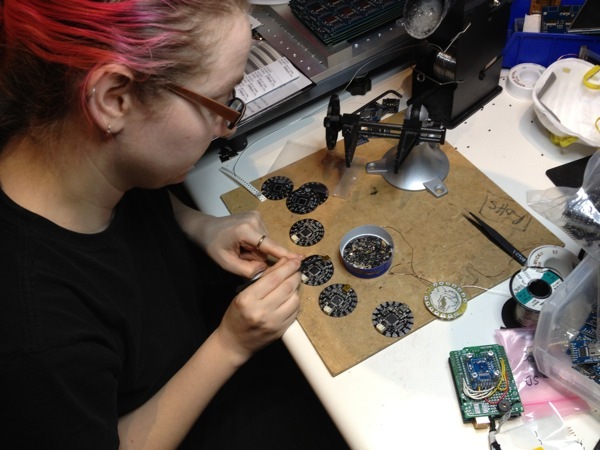 We’ll have updates and more big news soon in the wearable electronics space, so please stay tuned to the Adafruit blog. We have a product page you can sign up for soon, you can sign up to be notified when we have the first round of units ready. As always we’ll have great pricing for educators, resellers and hackerspaces. We’ve put together a list of features/decisions that we hope will answer many of the questions about the FLORA. Please feel free to post up any questions in the comments. There may be some minor revisions to the hardware since we are in beta and working with our testers in the field. We wanted to share our thought/design process, we hope it helps others when designing hardware. The FLORA is small (1.75″ diameter). We wanted the smallest possible board for our wearable platform. It’s based on our experiences shipping our own, shipping, customer-tested Atmega32u4 Breakout Board. The FLORA comes with projects at launch, the FLORA addressable and chain-able 4,000 mcd RGB LED pixels and premium stainless steel thread. Here’s a quick video! (HD version). The FLORA has built-in USB support. Built in USB means you plug it in to program it, it just shows up. No additional purchases are needed! Works with Mac, Windows, Linux, any USB cable works great. Currently the PCB comes with a mini B connector but future versions may change to microUSB. Either will work great. The FLORA has USB HID support, so it can act like a mouse, keyboard, MIDI, etc. to attach directly to cellphones. Our iPhone/iPad/Android app coming soon. The FLORA’s modules include: Bluetooth, GPS, 3-axis accelerometer, compass module, flex sensor, piezo, IR LED, push button, embroidered + capacitive keypad, OLED and more. The FLORA has a small but easy to use onboard reset button to reboot the system. The FLORA has an onboard 3.3v 100mA regulator with protection schottky diode and USB fuse so that power is consistent and can power common 3.3v modules and sensors. The FLORA has onboard polarized 2 JST battery connector with protection schottky diode for use with external battery packs from 3.5v to 16v DC in. Can be used with LiIon/LiPoly, LiFe, alkaline or rechargeable NiMh/NiCad batteries of any size. The FLORA has onboard power switch connected to 2A power FET for safe and efficient battery on/off control. Often FETs are not included in other designs that leads to switch failure as small SMT switches are rated for only 20mA current use. The FLORA power system is specifically designed to allow easy control and power of a large quantity of digital RGB LED pixels such as the FLORA pixel series of accessories. The FLORA is extremely beginner-friendly – it is difficult to destroy the FLORA by connecting a battery backwards due to polarized connector and protection diodes. The onboard regulator means that even connecting a 9V battery will not result in damage or tears. The FLORA has an ICSP connector for easy reprograming for advanced users. The FLORA has 14 sewing tap pads for attachment and electrical connections. Data buses are interleaved with power and ground pads for easy module and sensor attachments without worrying about overlapping traces which are not possible with conductive thread. 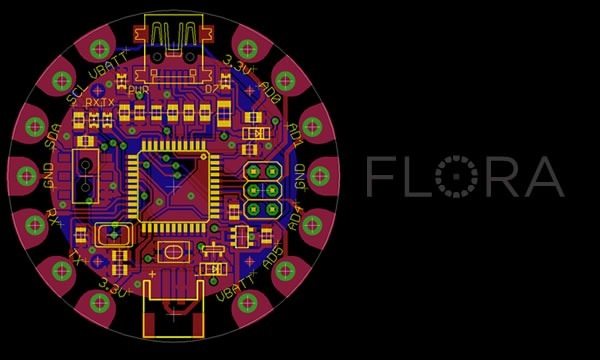 The FLORA works with the Adafruit-fixed Leonardo bootloader (not released) and will work with any future released Leonardo-compatible bootloader. FLORA is currently using our Adafruit bootloader and Adafruit USB vendor ID. 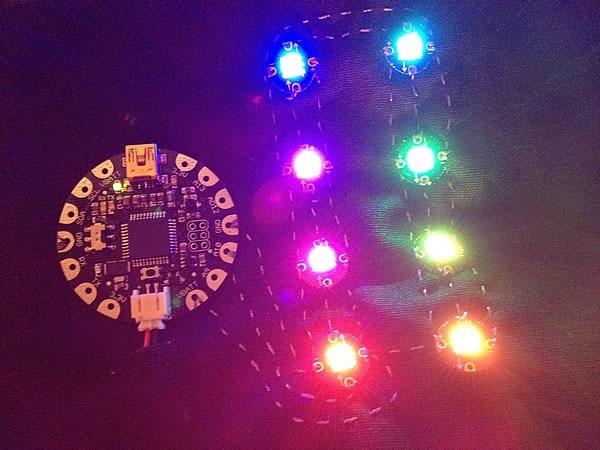 The FLORA comes with Adafruit’s support, tutorials and projects. 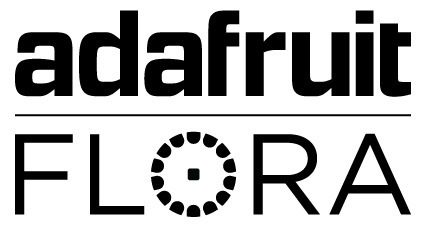 Adafruit has dozens of projects that will be released with the FLORA in 2012 and has staff 100% dedicated to creating tutorials and projects for use with the FLORA. The FLORA is made in NYC at Adafruit, it was designed by Limor Fried (Ladyada) she is an Electrical Engineer with a proven track record of providing over 26 high-quality libraries for Arduino/Arduino IDE, over 100 tutorials, open-source code and contributions to the Arduino project. She was a member of the MIT wearables group and likes to sew. We hope you’ll be as excited about FLORA as we are. Post any questions in the comments! We’ll stop back throughout the day to answer them! You are going to make a fortune out of it! great job guys. Can’t wait to see what people do with this. Looks exciting! I’m curious about the specs that drove the move away from the LilyPad. Could be a good opportunity to explain specifications in a design environment and tradeoffs required in doing so. hi chris! the FAQ details everything! feel free to post any questions we didn’t cover! Great choice of the 32u4, my Bus-Pirate-a-like should "just work" on it, giving an easy way to get prototyping with I2C and SPI devices over USB CDC serial. Now if someone can make a motorized zipper…..
Then add a temp sensor. It looks like they did their homework and found out all the problems people have had with LilyPads. Problems with power, connecting the FTDI backwards, the switch burning out, etc. Also they upgraded to the new AVRs everyone is starting to use and added a few more features. I’m not sure “move away from the LilyPad” is the best terms. Really it’s the same idea, but 2.0 with bug fixes and new features. But they had to give it a new name obviously. I’m more interested by those RGB modules that seem to be 1-wire controllable/addressable according to the picture. What IC is running them? WOW! This is REALLY, REALLY COOL! Congratulation Ladyada! I wish you all the best with this great new product. Maybe you can show this to the clothing designers there in NYC and get them to incorporate this into some of their clothing designs or lines (Diana Eng?) to help Make (pun intended) this more mainstream. The future is bright with blinky Flora clothing, and accessories too! Totally awesome. 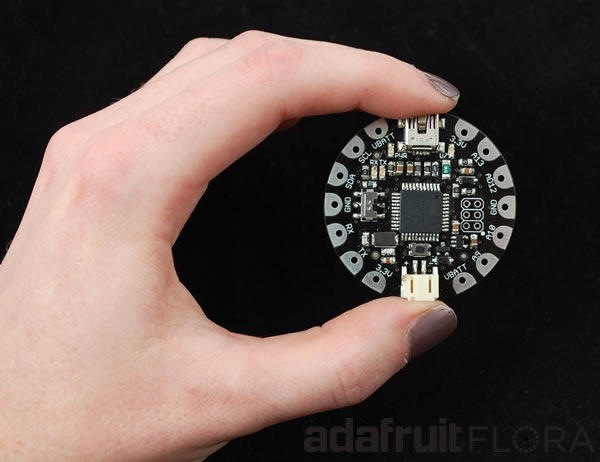 The best selling point, IMHO: "The FLORA comes with Adafruit’s support, tutorials and projects." @alex – the board will be under $30 for sure, in fact likely a lot lower. we’re going to be making these in volume and we want to have the best low-cost platform there so our goal is to have the best quality and the best price. Very interested in seeing the OLED module. Wow, this is a great product! One of the first things that caught my eye was connections to the RGB’s. VCC, GND, and A10.. New LED driver IC? OK, so I have some learning to do..
Super, super awesome. I was JUST about to buy a Lilypad but this is going to be way better for my project — particularly with those addressable LEDs! Please, please consider an XBee module. In breaking out the pins that you did, did you also give access to the SPI bus? I could figure this out with some pinout-checking, but figured you’d know offhand. I saw the SDA/SCL pins for two-wire were there. Is there somekind of accessory available to attach a stepper motor easily to FLORA? I would need to attach sensors and a stepper motor. please look into bluetooth v4 low-energy for this product. it’d be perfect since its meant as an ultra-low-power sensor-net style of adhoc networking. Exciting stuff! Consider dropping the The when referring to your product. Just Flora is good and confident. Best of luck! Any chance I can get my hands on a schematic (even if it is not for public release yet) so that I can add in first class board support in LUFA? If so, please email me. I want to use something like this (or jeenode) for part of whole-house sensor network. This one could be good for addressable RGB light but not (yet) for integrated radio + PIR (almost not enough i/o to toggle SPI slaves). Please consider a few more pins and drop some redundant ones … still looking to balance price point, i/o pins, and form factor and this looks good for mid-range all-in-one unit. This is simply amazing . Can you give more details on the Bluetooth connection? Getting wireless communication is very interesting. I’ll take two! It looks very cool. I can think of several LED projects to use this on. Could you explain how you are controlling the addressable LED’s with 1 wire? Manchester encoding? Hats off for getting that to work with addressable RGB’s! Great show tonight. Any idea of the price of the LED pixels yet? And what controller chip? Is the connection to android using adk? Addition to Lufa? Or is it HID mouse and keyboard style? I am incredibly excited about Flora! I already have a project planned-out for it around both Horse Riding (for show, imagine a rider’s coat and horses saddle glowing at different points and colors depending on what the rider/horse are doing) and a super-secret one that I hope to be the first to try and build with these Flora. Once again my hat’s off to the folks at Adafruit, who not only have the best electronics store on the planet but also never fail to deliver on unique and interesting products that sets the imagination on fire and inspire us to build more. I would like to design a simple mount that attaches FLORA to fabric. The mount could be a flat plastic ring the diameter of FLORA that could snap into the pad holes on the breakout using metal stand offs or clip type metal connectors. This could give way to daughter boards (much like shields on arduino) that could snap on the other side, punching through the fabric. This type of mounting strategy is potentially rugged and durable which would allow the removal of FLORA for flashing or modding not to mention washing the fabric. How are the “modules” connected to Flora? Excellent idea! I prob. missed it, but will the UART pins be accessible? I am interested in using this for MIDI apps, but not MIDI over USB. Will this be compatible with the LEDs and sensors from the Lilypad kits? It would be nice to reuse those.